Features and Benefits Includes Mattress & Cover (pump not included) 16 laser air holes to keep patient cool and dry. Removable, water resistant, non-shear, anti-microbial nylon cover. CPR valve provides rapid deflation of mattress. Non-skid cover prevents mattress from slipping. Dimensions: 35"x80"x8". Weight: 9 lbs. Alternating cell depth: 8". 16 laser air holes to keep patient cool and dry. 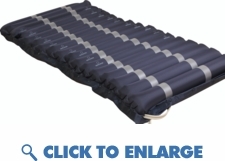 Removable, water resistant, non-shear, anti-microbial nylon cover. Non-skid cover prevents mattress from slipping.